Tiny Houses are heavy and most are not built to be moved often. Even those built with lightweight steel framing, and ultralight materials still tend to be bulkier and less aerodynamic than similarly sized travel trailers – so a stout truck is essential for the mobile tiny home owner. Bryce and Rasa, the folks behind Living Big In A Tiny House, travel full time and produce videos focused on tiny houses, so they needed a stout truck for work and life. On their last U.S. tour they bought an ex-ambulance for just $15,000 that they’ve nicknamed it the Campulance. It’s a 2008 Chevy Kodiak C4500, with a Duramax 6.6-liter V-8 turbodiesel with an Allison transmission, 2 wheel drive, and duel rear wheels. The towing capacity for a Kodiak C4500 is between 12,000 and 15,000 pounds depending on the specific configuration… so plenty of power and towing capacity for most tiny houses. So far they’ve not added any permanent comforts to the interior configuration, but plan to add a kitchenette, some natural materials like wood, and a larger bed next year. They’ve waited to do interior customizations partly due to the stock ambulance setup which provides ample seating, storage and function. That’s a twin air mattress on the floor that they put away when not in use. Below is Rasa editing one of their films. The main benefit of the Campulance is that they can leave the tiny house behind when they need to travel fast while still having a place to live. The main disadvantage of a truck this size is low fuel economy. I’m not sure what Bryce and Rasa are experiencing, but I bet on a good day the miles per gallon are in the teens, and around 10 mpg while towing. But when your business is traveling to film tiny houses, I bet all that fuel cost could be written-off as a business expense. Another minor issue is the headroom – which would be sufficient for many folks – just not Bryce, who is 6′ 3″. 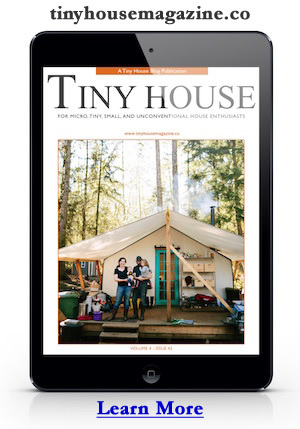 Read more about their Campulance at Living Big In A Tiny House. Be sure to subscribe to the Living Big In A Tiny House YouTube Channel for more great videos like this. Photo credit to Bryce Langston & Rasa Pescud. Be sure to watch his tour video below. This entry was posted in Tiny Living and tagged Allison transmission, Bryce Langston, Campulance, Chevy, Duramax, Kodiak C4500, Living Big in a Tiny House, Rasa Pescud, turbodiesel. Hmm. Curious. A tiny house being driven all over the USA, is, well, an RV made of wood. While it makes sense (sort of) for a couple of specialty writers, I think it defeats the major purpose of a tiny: low environmental impact. Just my $0.02. I do not get this – Americans wanting to live in a tiny house, but then they go out and buy a huge monster of a truck to haul the house. Not exactly environmentally friendly. Wonder whatever happened to staying in one place and spending less time polluting.